Robin Hood has lived a fairly extensive cinematic life, from Errol Flynn's classic swashbuckler show and Disney's animated tale to the forthcoming Ridley Scott adaptation with Russell Crowe set to take the reins at the folk hero. Then, there's Kevin Reynolds' Robin Hood: Prince of Thieves -- a semi-hammy yet stern-faced mock of the exciting classic adventure program. Though some of the action portions are somewhat gripping and the pace keeps it breezy enough, the absurdity lying underneath makes it a merely tolerable period popcorn-chomper. 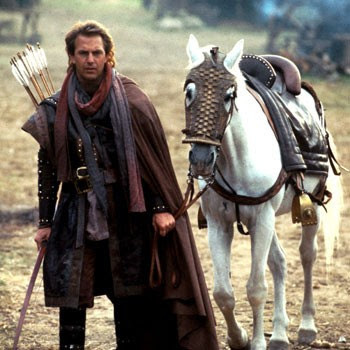 At the head is Kevin Costner as Robin Hood, an ex-Crusader fresh home from escaping Turkish captivity during the wars. He has a Moorish tagalong named Azeem (Morgan Freeman) dedicated to saving his life from peril, traveling across the seas with him as his "servant" while Robin returns to his noble existence. When he arrives to find his family's castle in shambles, clearly sacked and left for dead, he ventures out to discover what has happened and claim revenge for his father's death. It's at this point that the mythos starts to grab hold, introducing us to his childhood friend Marian (Mary Elizabeth Mastrantonio), a stubborn bandit in the woods named John Little (Nick Brimble), and, more importantly, the root of turmoil within the English countryside -- the Sheriff of Nottingham (Alan Rickman). Robin Hood holes up in Sherwood Forest with his merry men, including an auspicious rogue named Will Scarlet (Christian Slater), to help and protect those who are suffering under the sheriff's greedy thumb. He trains commonplace people to shoot bows and arrows, fight hand-to-hand, and essentially become proficient rogues. And, like lore suggests, he steals from the rich passersby in the forest to continue funding their protective services. The classic '30s Adventures of Robin Hood may be a bit on the chipper side with its serial nature clearly dangling on its sleeve, but it's certainly more straightforward entertainment than the more epic-scaled Robin Hood: Prince of Thieves. Director Reynolds, who has since come at audiences with a much tighter historical action / adventure romance with Count of Monte Cristo and Tristan + Isolde, shows sloppiness about his direction through awkwardly-poised scenes and a discomforting eye for audience awareness. It intermixes easy laughs through slapstick humor with seriousness and, at times, darkness through the Sheriff's antics, all in a way that blends like water and oil in utterly predictable fashion. It doesn't help that Kevin Costner ain't exactly Errol Flynn either; fresh off of his strapping turn as both actor and director on Dances With Wolves, his carry-over charisma only works on a marginal level. Little glimmers peek through -- like most of the sequences with the recognizable but still brilliant Morgan Freeman as the misunderstood Moor -- but his chemistry mostly fizzles with the rest of the cast, even Mary Elizabeth Mastrantonio on most occasions. Some of it hinges on his clear lack of character definition, as he's obviously keeping the image of "Kevin Coster" clearly there as a bargaining chip for the film's pop culture success at the time. Instead of ensnaring Robin Hood, he instead gives the picture gloss as an alluring masthead -- fine enough, but nothing short of mediocre. With Bryan Adams' hit song "Everything I Do" and the now-famous Morgan Creek musical cue also peeking their head around every corner, it feels way too artificial for a film so deeply rooted in medieval action. Taking this rendition of Robin Hood on any serious level isn't possible, even if it tries to quite a number of times and has updated the costumes to studded leather, intricate garments instead of "merry men" stockings. Sure, there's an obvious keel that harks to its serial-minded predecessor, but it's an excuse that can only spread stucco over a few of its leaky holes. Most of the glaring awkwardness revolves around Alan Rickman's Sheriff of Nottingham, a dark character who bolsters and puffs himself up to silly proportions to intense degrees. Though Rickman's gusto clearly shines through, which is always enjoyable, the material he's given as the dastardly villain is groan-worthy. That doesn't stop Prince of Thieves from sneaking in a subtle stream of entertainment from start to finish, keeping the fight sequences, sword duels, and fire-laced archery shots (including an iconic scene that most of the world has seen) enjoyable choreographed and edited to such a fashion that it keeps things rolling along smoothly. Though it's a smidge sluggish at the forefront, the pace kicks into gear once Robin hooks up with Little John and starts his mini "crusade" against the sheriff's greed. Armed with training sequences and battles that build up to a fiery conclusion, it does know how to put on an exciting show. Taken on that level alone, it's wholly feasible to sit back and get drawn into the flying arrows, overwrought death sequences and semi-hammy speeches from Kevin Costner. Robin Hood: Prince of Thieves persistently reminds us through this that it could've been a better film if it had tried, though it opted for logic-handicapped thrills, cheesy one-liners and dull-pointed stabs at cheekiness instead of any form of tangibility. If you just listen to blades clank while trying to stomach the false chemistries running amuck, it might just offer enough unsubstantial razzle dazzle to enjoy -- but that's it. Robin Hood is obviously Kevin Reynolds' testing grounds for the period action epic, shown as a proper break-in film for the medieval romances to follow where he clearly doesn't make the same mistakes as he does here.